Anorak News | German Gorbuntsov: who is the wanted Russian banker shot in London? German Gorbuntsov: who is the wanted Russian banker shot in London? GERMAN Gorbuntsov, 45, was shot six times outside his flat near London’s Canary Wharf on March 20th 2012. The Russian businessman who fled his country in 2009 says he knows who tried to kill him. He claims four men are behind his attempted murder. One of them is said to be close to Vladimir Putin. Gorbuntsov says the attack is linked to his decision to help the police in their investigation of the attempted murder of banker Alexander Antonov in Moscow in 2009. Antonov was Gorbuntsov’s partner and co-owner of Konvers Group. Antonov recovered. He fled to London. Whoever the hitman is, one thing is certain: he’s not all that good at it. The MoS says the four men are “understood” to have denied any wrongdoing. As for the facts, well, Gorbuntsov’s shooter was captured on CCTV. He’s slim, white and around 6ft and slim. What odds on the police catching him, let alone bringing the would-be murderer and his alleged Associates to justice? Slim. Minds turn to the murder of former KGB operative Alexander Litvinenko in London. No-one has been made to answer for that crime. When a wealthy or prominent Russian who flees his native land is in trouble does Putin’s Mother Russia help or see it as PR? The Mail tells us that Mr Gorbuntsov is listed as ‘wanted’ on the website of Moldova’s Centre for Combating Economic Crimes and Corruption, over allegations of an illegal bank takeover and embezzlement. 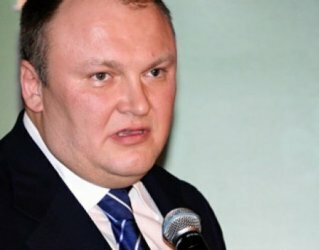 Moldovan prosecutors opened several criminal probes into German Gorbuntsov, who was shot outside his home in east London on Tuesday, after a bank he owned there, Universalbank, was closed down in February, Komsomolskaya Pravda reported. “We can write a thousand requests but Britain will never extradite him to us,” it quoted anti-corruption prosecutor Viorel Radetchi as saying. Gorbuntsov, 45, was convicted of robbery in the 1980s and went into business in the 1990s as a founder of some 40 companies. He began his financial career in 2002 as a shareholder and director of Interus Bank. In 2005, the bank was stripped of its license for suspected money laundering, according to investigators.